The following topic describes all the visual elements and terms used in a standard RadDatePicker and RadTimePicker. Selected Value: Represents the currently selected value. RadDatePicker/RadTimePicker: A button that represents the control's UI. Click or tap it to open the Date/Time Selector Popup. Date/Time Selector Popup: Represents the Popup containing UI for selecting date/time. 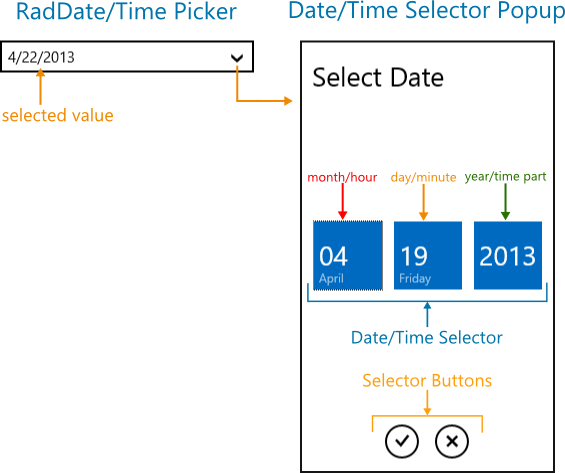 Date/Time Selector: Represents the date selection UI. month/hour: Represents the selected item for the month/hour. day/minute: Represents the selected item for the day/minute. year/time part: Represents the selected item for the year/time part. OK Button: Represents the button that confirms the selected value and closes the Popup. Cancel Button: Represents the button that rejects the selected value and closes the Popup.